Here is another recipe I published from the 2011 “40 Days of Joy” series. It is easy, delicious and perfect for year-round entertaining. Thanks again J.T. for sharing this recipe. Two small cans of Cannellini beans. 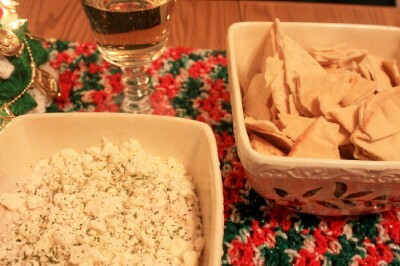 A container of crumbled feta cheese. Drain cans of beans completely (no liquid) and then puree the white beans in a blender. Slowly add the Girard’s dressing (about 1/2 bottle) until its smooth and creamy. Fold in the 1/2 have container of feta cheese. Pour dip in a bowl. Sprinkle remaining feta cheese on top. Shake a few dashes of your favorite spices (basil, paprika) on top for color. I made the dip this afternoon. It is easy and yummy! You cannot go wrong fixing this for your holiday get togethers. Also I topped it with Tastefully Simple’s “Spinach and Herb” dip mix for color. I love making dips with white beans. This looks so good and super easy. Will have to give it a try. It is a delicious dish quick and easy to make, and in this season of hustle and bustle quick and easy is important.